Steelhead trout are entrenched in the economy, ecology, and culture of the Pacific Northwest. Declining numbers of steelhead in the rivers flowing through British Columbia, Washington state, and Oregon are troubling fishers and fisheries managers alike. 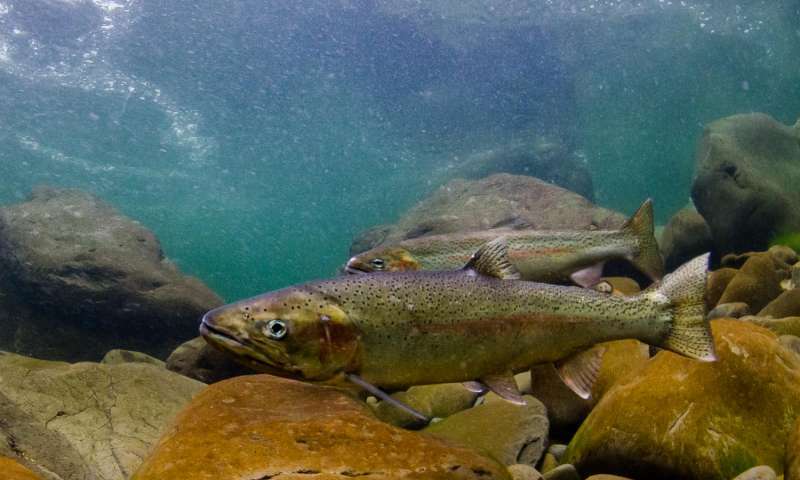 A new study published today in the Canadian Journal of Fisheries and Aquatic Sciences (CJFAS) shows that survival of young steelhead trout in ocean environments has also been precipitously declining. Survival of juvenile steelhead in the ocean has recently been considered a possible factor in the decline of these fish but to date long-term survival and abundance trends among Pacific Northwest populations were largely unknown. Now, using multiple decades of data for 48 populations of wild and hatchery steelhead trout, scientists at the Washington Department of Fish and Wildlife have shown that declining survival of juvenile steelhead in the ocean is strongly coupled with significant declines in the abundance of adults. "We were able to compile data from multiple reports and databases to document survival in the ocean of Oregon, Washington, and BC steelhead trout and show that these trends paralleled declines in adult abundance and also differ among populations originating from different areas," says Dr. Neala Kendall, lead author of the study. "We believe this is the first time these data have been brought together in a single study." Populations with particularly concerning declines were those in the Lower Columbia River and in Puget Sound, an inlet of the Pacific Ocean and part of the Salish Sea that extends north and south of Seattle, Washington. The study found that among populations in Puget Sound, ocean survival of juvenile steelhead in the 2000s has declined by 77% on average compared to the 1980s; survival averaged 3.1% in the 1980s but dropped to 0.7% in the 2000s. The study found parallel trends in adult abundance. Specifically, numbers of adults in Puget Sound steelhead populations in the 2000s have declined by 53% on average compared to the 1980s. The declines in juvenile survival "likely contributed to these fishes' low abundance," says Kendall; abundances are so low that Puget Sound steelhead were listed for protection under the Endangered Species Act in 2007. Steelhead populations in British Columbia included in the study also have all declined in abundance and ocean survival since the 1980s. Declines in survival of juvenile steelhead in ocean environments were not as drastic for populations along the coasts of Washington and Oregon which are not listed under the Endangered Species Act. Survival and abundance trends, like those generated in this study, can enhance current tools being used to predict changes in steelhead populations. To best conserve steelhead in the Pacific Northwest, especially recovery efforts for Puget Sound populations, "stakeholders and concerned citizens want to better understand why these populations have been struggling and how marine survival has contributed," Kendall says. "With this information, policymakers and managers can have different expectations about Puget Sound and Lower Columbia steelhead [compared to] fish on the coast due to their different marine survival patterns," she adds. Kendall sees this study as providing further support for ongoing efforts by natural resource agencies and NGOs to improve steelhead survival and protect the habitats these juvenile trout use upon arriving in the ocean. These include reducing shoreline armoring (e.g., construction of seawalls), protecting and promoting forage fish, understanding the impacts of marine mammals, and decreasing exposure to parasites and chemical contaminants. The research is part of the Salish Sea Marine Survival Project, a US-Canada collaboration of more than 60 organizations conducting research to understand why salmon and steelhead are dying in the Salish Sea. The article, "Declining patterns of Pacific Northwest steelhead trout (Oncorhynchus mykiss) adult abundance and smolt survival in the ocean" by Neala W. Kendall, Gary W. Marston, and Matthew M. Klungle was published today in Canadian Journal of Fisheries and Aquatic Sciences. Recent research in inland seas, including Puget Sound and Georgia Basin, suggests that pinnipeds such as harbor seals (Phoca vitulina) contribute to the mortality of migrating smolts, including steelhead (Berejikian et al. 2016) and other salmon (Thomas 2015). Puget Sound steelhead experience high levels of mortality in the Sound during their migration to the ocean despite relatively short migration distances, mortality rates that could not be sustained and have any adults return to spawn (Moore et al. 2010b, 2015). Friedland et al. (2014b) also suggested that punctuated, sizedmediated predation controls marine survival of Keogh River steelhead smolts.